It’s not the Hyderabadi biryani; it’s not even the pearls; it’s the December 7 Telangana elections that the country is talking about. But just like we now appreciate digitalization in other things like payments and education, it’s high time that we digitalized voting information for Telangana voters too. 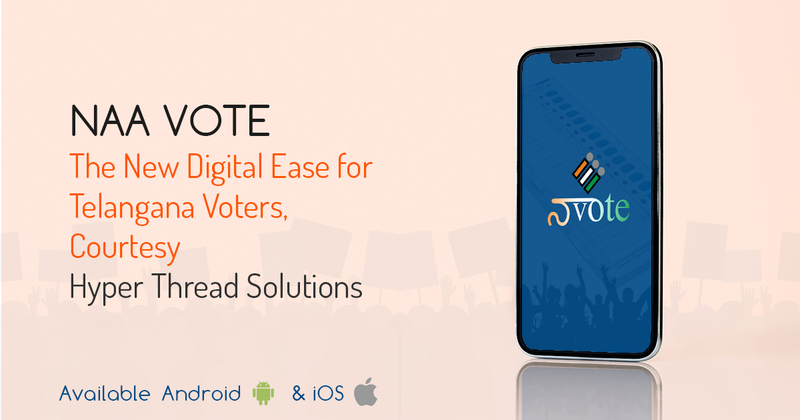 That’s what Hyper Thread Solutions did when it launched the Naa Vote App – an Android and iOS mobile application that lets Telangana’s voters look up electoral lists, polling stations, and so much more. This handy app was launched by the Chief Electoral Officer of Telangana, Dr. Rajat Kumar on 29th November 2018 for the benefit of the voters of Telangana. “Naa Vote” meaning “My Vote” is a joint endeavor of the Telangana government and the NGO, Let’s Vote in collaboration with Hyper Thread Solutions not only to make the citizens more aware but also to serve them in a more efficient manner. Its highlight, however, is the feature for PwD (persons with disability category) which enables the voters under the said category to request pick from home to the polling station and back home via this app. While hitherto, the voters had relied on manual lists and many a time, even verbal information about the polling stations and candidates, this app comes as a fresh alternative for voters who need instant access to information like voting lists, polling stations, routes to these stations, contesting candidate categories, personal electoral details, and even so much as requesting commutation arrangements for the voters under “persons with disability” category. Keeping in mind the busy schedule that people have in the present times, an app that provides them all this information on the go, is just what makes perfect sense since Telangana voters located anywhere can have access to this information once they have downloaded the app. The excitement doesn’t end there. There’s more than the citizens on Telangana can reap out of this app. One – the coming days will see a load-full of features in the app. Two – there’s an exciting logo contest. The logo contest, as announced by the Joint Chief Electoral Officer, Ms. Amrapali Kata, is an interesting one. The app, for now, bears a temporary logo, and to affix a permanent one, the contest is open for all citizens of Telangana, to design one and participate in the contest. The logo should bear the words “My Vote” in Hindi, English, Telugu or Urdu. The contest is open till December 6th, a day prior to the election. The winner who will take home INR 15,000 will be announced on the 10th December. Ready to Download Naa Vote App? The app is easy to download like any other app, but what’s better is the simple interface that even a school-goer can use and the real easy-to-use features. All you need to do in order to find the information that you need is feed in the EPIC number, constituency, and area; no registration process required since you are already a voter that has records with the electoral office.